While mobile devices have gone through several generations of technology evolution, corresponding authentication mechanisms have begun to move away from relying solely on PINs/passwords to depending more on biometrics. For example, voice biometrics is now becoming a standard authentication method on a mobile device to provide user to device authentication as well as to support a growing range of mobile applications, such as e-commerce and mobile banking. However, current mobile voice authentications are susceptible to spoofing attacks. For instance, Android’s voice login is vulnerable to replay attacks and Google advises users on the vulnerability of their voice logins by displaying a popup message ”... a recording of your voice could unlock your device.” In our work, we propose to explore human physiology to discover new biometric traits associated with the human speech production system to enhance mobile voice authentication. In particular, we discover two types of biometric traits in the human speech production system: (1) phoneme sound origin, and (2) articulatory gesture. We take a mobile sensing approach that exploits the rich sensing capability of the mobile devices to capture such new biometric traits of a user for enhanced security. The proposed research could shape our understanding of voice authentication on mobile devices by considering new biometrics and the rich sensing capability of mobile devices. 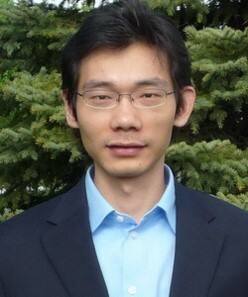 Jie Yang received his Ph.D. degree in Computer Engineering from Stevens Institute of Technology in 2012. He is currently an assistant professor in the Department of Computer Science at Florida State University. His research interests include cybersecurity and mobile computing, with an emphasis on user and device authentication, wireless security, location systems, mobile healthcare and vehicular applications. He is the recipient of the Best Paper Award from IEEE Conference on Communications and Network Security (CNS) 2014 and the Best Paper Award from ACM MobiCom 2011. His research has received wide press coverage including MIT Technology Review, The Wall Street Journal, NPR, CNET News, and Yahoo News. He is a member of the IEEE.